Monstrous heralds of change, the sight of whom only children can survive. Monsters born of the battlefield, in gunfire and frost and blood, clothed in too-familiar flesh. Monsters, human and otherwise, born of fear, and love, and retribution all, wrapped tight and inextricable one from the other: the Fallen outside of time, lovers and monsters in borrowed skin, and creatures from beyond the stars and humans who have travelled to them. Dreams of lost and siren-song depths--of other half-held, half-remembered lives. And the things we have survived, and the things we might yet survive, in the face of greater, eviscerating loss. Michael Matheson is a genderfluid writer, poet, reviewer, anthologist, and managing editor (CZP eBooks) with ChiZine Publications. A graduate of Clarion West ('14), their fiction and poetry can be found in a handful of venues, including Ideomancer, Stone Telling, and an eclectic selection of anthologies. 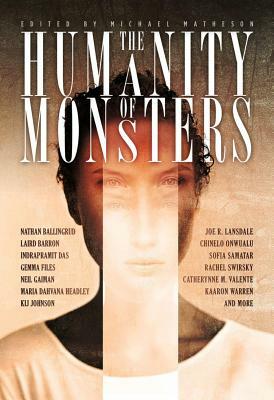 THE HUMANITY OF MONSTERS is their first anthology as editor. Find more at http: //michaelmatheson.wordpress.com, or on Twitter @sekisetsu.